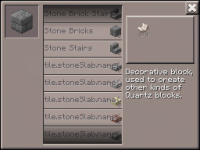 In the crafting interface, names for items are taken directly from their ID, and not what they are called in game. MCPE-2474 Dyes, Melon Seeds, and Wooden Slabs missing names. 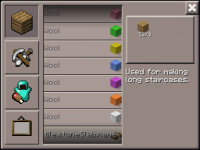 MCPE-2597 Missing item names for all dyes, and other various items in crafting table. 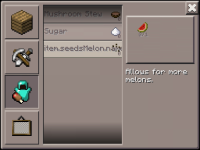 MCPE-2968 Name for Melon Seeds? MCPE-3015 can't pickup water or lave with split controlls on! MCPE-3051 The sandstone slab has a wierd name, like title.entity or something like that. MCPE-3197 When clicking on a half-slab, the name that appears above my hotbar is all funky. MCPE-3373 Stairs, and Bone Meal have broken names. MCPE-3793 Cannot craft wooden or stone slabs bug!! MCPE-3794 Wooden and stone slabs have a wired name bug it's messed up!! MCPE-3795 The dyes have a wired name it's a bug the wool dyes have a very wired name it's a bug!! MCPE-3797 The wooden and stone slabs have a weird name it's a bug!! MCPE-3812 Melon seeds have a weird name bug!! 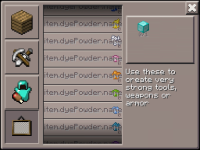 MCPE-4469 Some items do not show their name correctly in the crafting menu.